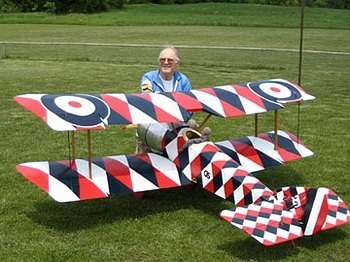 Al Horner's World War 1 RC Airplanes. 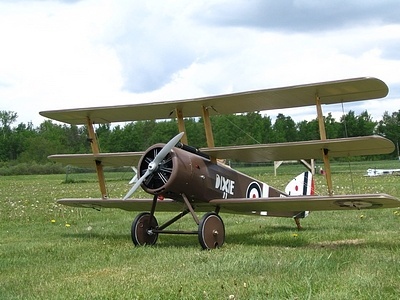 A One Third Scale Sopwith Pup. This is a Balsa USA kit I usually build about 50% kits to 50% scratch built I have done loads of modifications to this one. I have pull-pull on both the elev & rudder. Also the landing gear is now as per full size with the bungee cords around the axle & it is working in slots at bottom of the gear . The paint scheme is from a data windsock files book . Full size was in Wiltshire UK , & was a trainer plane , hence no guns. The ribs have simulated stitching & have rib tapes. Covering is super shrink coverite , 2 coats dope & then Behr latex paint , all roundels & lettering are painted by hand The scheme took for ever as you may see. I in fact used 5 rolls of 3M 1/8?x 30 ft long masking tape . On the wings I made up 4 small plates about 5/16" wide x 1-1/4" long. These go on the root of wings where they meet the fuselage. This is to stop the wings moving so easily. If you just tap the wing tips on the model, as it is built , you can move the wings forward a lot. A strange thing - I had a quarter scale RC Sopwith Pup (Boddington kit) & it would roll great , whereas this one won't roll worth a darn. The first one was a one piece wing whereas this one is separate panels. Will roll till upside down, but the next part of the roll is frightening. 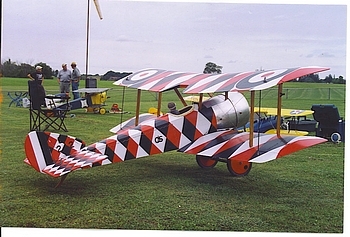 A Quarter Scale RC Sopwith Triplane. 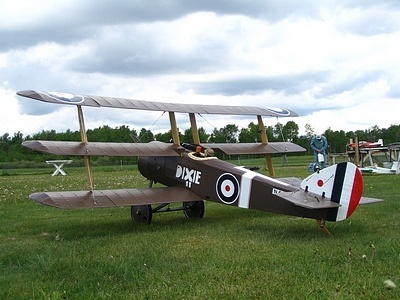 This is my I/4 full size Sopwith Triplane. I designed it myself from a 3 view which was in Flying Scale Models magazine. I also had a load of full size photos of the Sopwith Triplane that was at the Shuttleworth Trust in Old Warden in the U.K.
Power is a Zenoah G26 with an APC 18-6 W prop. Weight is 17lbs. For my other World War1 RC Airplanes I used Super Shrink Coverite for the covering material but this time I tried dress lining material, as the coverite was hard to find. Anyway – the dress lining only shrinks about 10%, so nowhere as good as the coverite. I have simulated rib stitching and have rib tapes on the wing & stab . I put 2 coats of clear varathane & then used BEHR latex paint for the colors . Actually I had a small can of PC10 in the real color,which i obtained in the U.K. So I went to Home Depot who made an exact match of the PC10 for me. The landing gear is as per full size , the axle goes up and down in slots with bungee cords around the axle. It has a fiberglass cowl which I made myself, made a box out front of the firewall to put the batteries in , to help the weight being up front . Interestingly the “Dixie “ name on the model is from the real World War 1 pilot. Either his wife or his girl friend. The cross on the fuselage,in front of stab is from the pilot's school . I wrote to the Shuttleworth Trust & they gave me a lot of info on the full size machine. 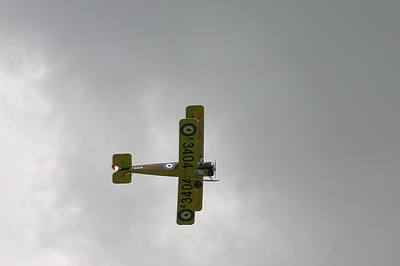 The first “DIXIE” was shot down by the Germans , this is a replica of “DIXIE 2” . 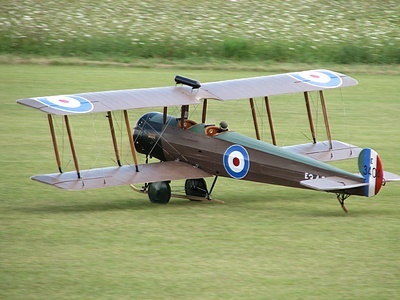 The Avro 504K was scratch built from Boddington (UK) plans. It is 1/4 scale & is 9ft span . I used super shrink Coverite , 2 coats of dope & then used Behr latex paint which I had mixed to PC10 ( the authentic colour). I used sponge rubber brushes to apply . The roundels & lettering are hand painted on . I used 60lb fishing trace plastic covered wire for the flying wires. There are 80 wing ribs with proper rib stitching on them all. It took 8 mins a rib. I well remember that !! The long piece of ash between the wheels is to help the training pilot (full size guy) from breaking the prop if he nosed over. It is a nuisance in two ways. I keep hitting my foot on it when starting the engine up, also when landing I have to have it fairly level on approach or the front of the ash will dig into the ground .